These enlargers are used and may have minor cosmetic marks from previous use, but have been reconditioned to factory specifications and are in perfect working condition. 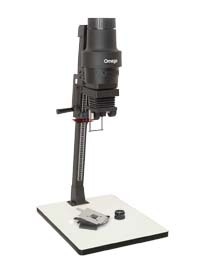 Supplied with 120V 75W opal enlarging lamp, condenser lenses, filter drawer, red safety filter, 50mm f/3.5 enlarging lens, 35mm negative carrier, and instruction manual. Lenses and negative carriers for other negative formats can be purchased separately.